Director: Matan YairWriters: Matan YairStars: Asher Lax, Ami Smolartchik, Yaacov CohenSummary: 17-year- old ASHER has always been the impulsive troublemaker, from primary school, all through junior high and high school. It's hard for him to concentrate in class, and he is compelled by a lot of rage and violence; yet he is also endowed with a considerable amount of charm and street wisdom. 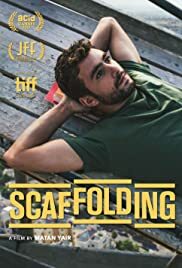 While his strict father sees him as a natural successor to the family's scaffolding business, Asher finds a different masculine role model in his gentle literature teacher Rami and forges a special connection with him. Torn between the two worlds, Asher looks for a chance for a new life and new identity. When a sudden tragedy occurs, he has to take the ultimate test of maturity.